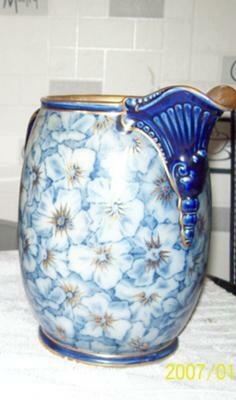 Looking for Information on Grandmothers Pair of Doulton Burslem Jugs. These Doulton Burslem Jugs are my grandmothers and I am looking for any information regarding their origins, designers or date of manufacture. We have 2 jugs with matching paintwork decoration but one stands taller than the other. There are ‘Doulton Burslem England’ marks and the stamp just has the coronet on top of the badge. Can anyone please provide any more information on these pitchers or jugs please? I have one similar. The Coronet is for the ‘Prince of Wales’ and is circa 1887-1896. My one has the ‘C’ mark and a 4 digit registration number and the artists initials AW for Ada Worthy. Check out the marks underneath on the ‘Doulton Marks’ section of the website.